On May 27th, 2011, the U.S. Consumer Product Safety Commission, in cooperation with Hewlett-Packard Co. of Palo Alto, CA announced a voluntary recall of various models of their HP and Compaq notebook computers due to a fire hazard and burn hazard to consumers. What do you need to know about this second recall? Since the May 2010 recall expansion and as of todays date on this second recall posting, HP has received 40 additional reports of batteries that overheated and ruptured, resulting in seven burn injuries, one smoke inhalation injury, and 36 instances of property damage. The recalled lithium-ion rechargeable batteries are used with various model series of HP and Compaq notebook computers and include batteries that consumers were informed were not included in previous recalls. The computer model number is located at the top of the service label on the bottom of the notebook computer. The image shown at the beginning of this article illustrates one example of where to look to find the information needed to determine if you have a product that is effected by this recall. Not all batteries matching the bar codes are being recalled. These products were manufactured in China and sold in computer and electronics stores nationwide, and also online at hp.com and hpshopping.com from July 2007 through July 2008 for between $500 and $3,000. The battery packs were also sold separately for between $100 and $160. 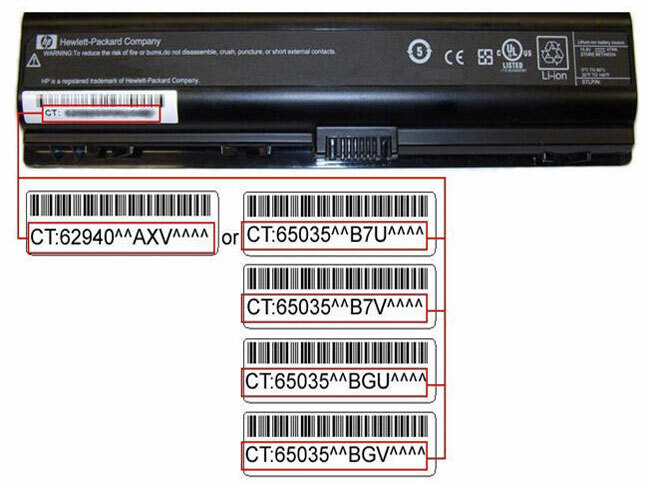 Consumers should immediately stop using these products and remove the batteries from their notebook computer and contact HP to determine if their battery is included in this recall. Consumers with recalled batteries will receive a free replacement battery. After removing the recalled battery from their notebook computer, consumers may use the AC adapter to power the computer until a replacement battery arrives. For additional information, visit the HP Battery Replacement Program website or call (888) 202-4320 between 7 a.m. and 7 p.m. CT Monday through Friday. To find more information on the notebook model numbers which have batteries that are effected by this recall, consumers can visit the CPSC website to view a chart of the included products along with other identifying images of the various models of these recalled batteries.